How do you calculate/estimate hypersonic leading edge and skin temperatures? At lower speeds (below Mach 5-ish), stagnation temperature (TAT) is a very accurate proxy for skin temperature. But at mid/high hypersonic speeds (especially in the thin upper atmosphere where mass flow is low), thermal radiation bleeds off a significant amount of heat, especially as temperatures climb into the thousands of Kelvin. How far off am I? How do you actually estimate hypersonic skin temperatures (without CFD)? (Data are actual temperatures, where available. Stag is stagnation temperature. Rad is predicted temp using the above formula. Drag areas are pure guesses. Surface areas were 10-12 m^2 for the X-43A, X-51A, and HTV-2. Mass flows were 20-40 kg/s/m^2), except for the X-51A, which encountered 140 kg/s/m^2). For predicting skin temp, stagnation temperature seems more accurate at lower mach, formula temperatures at higher mach, as expected. Admittedly, I'm pleased (and surprised) that the formula even yields ballpark figures. However, it's a bit sensitive to drag area and radiating surface area, and these are the only data for which I have estimated surface area, so I can't be confident this formula works well for other aircraft. Some background: I'm taking on a fun project (nothing serious), so a first approximation (say, to within 100 K) is good enough. I've tried to follow the etiquette as best as I can, but I'm pretty new to Stack Exchange, so let me know if I should change anything :) Thanks! where the parameters $N$, $M$, and $C$ depend on the configuration and $q_w$ is the heating in $W/cm^2$ (this is all from Hypersonic and High Temperature Gas Dynamics and I highly recommend this book). where $R$ is the radius, $h_w$ is the wall enthalpy and $h_0$ is the total enthalpy. where $T_w$ is the wall temperature and $x_T$ is the distance along the body measured from the onset of the turbulent boundary layer. Phew, I believe I typed all those correctly. These are approximations but are really the simplest approach to get answers without requiring simulation or data measurements. Great for an initial estimate. In the aforementioned book, these expressions are attributed to the paper Aerothermodynamics of Transatmospheric Vehicles. The approach there is to assume that the heating can take a form like mentioned in the first expression and relating that to the wall temperature for a fully catalytic material, then finding the values for $C$, $M$ and $N$ that are roots of the system. 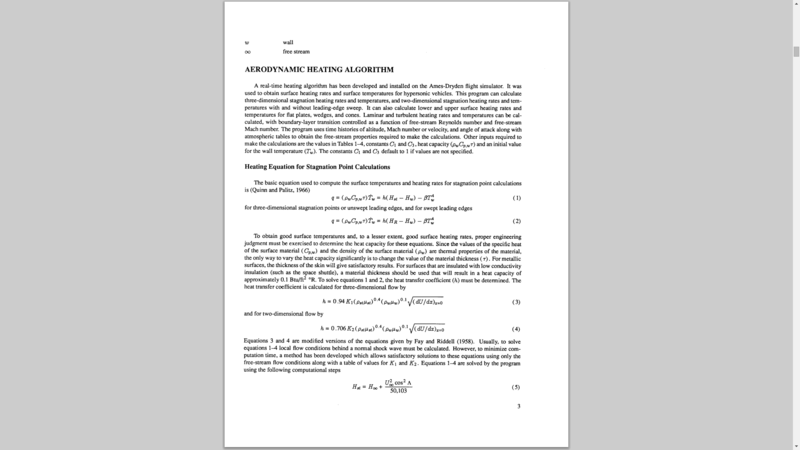 I found a NASA technical memo for very accurate "Real-Time Aerodynamic Heating and Surface Temperature Calculations for Hypersonic Flight Simulation." The authors also discuss a bit how they obtained their expression. I have to say, though, Dave's dissertation and tgp2114's answer are wholly sufficient and more straightforward. Not the answer you're looking for? Browse other questions tagged fluid-dynamics temperature aerodynamics or ask your own question. 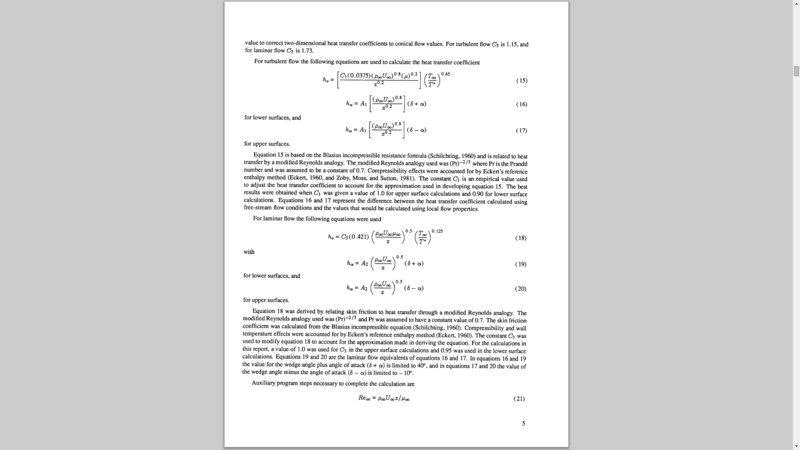 How is the Joukowsky Transform used to calculate the Flow of an Airfoil? 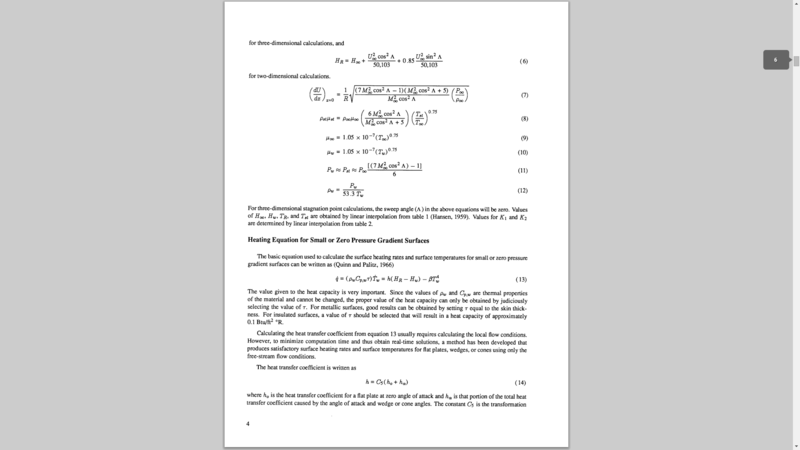 How do you calculate vortex shedding frequency? How can you calculate air resistances at different speeds? How do you add temperatures? How to estimate wind speed from a pressure difference? How to calculate fluid or air velocity and pressure field with boundary conditions? 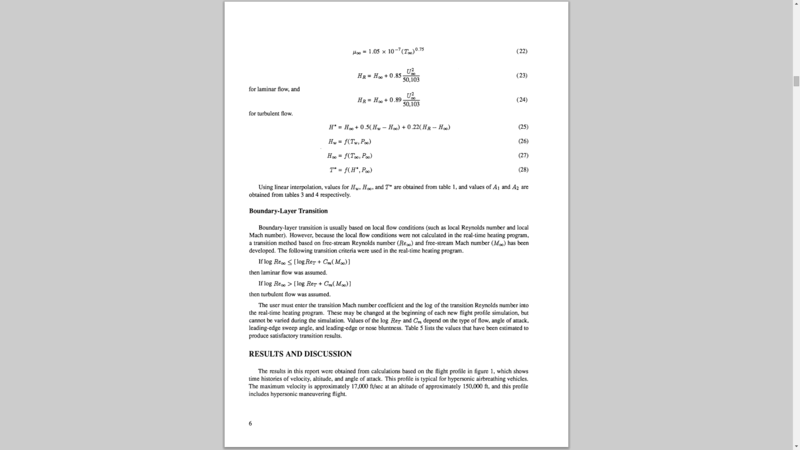 But how exactly do you calculate the Joukowsky Airfoil, within a minimal margin of error?